The Lesotho Rugby Academy is a charity programme run through Dolen Cymru (the Wales-Lesotho Link), a registered charity in the UK, in partnership with the Federation of Lesotho Rugby (“FLR”). The FLR tries to tie in the Academy to its wider rugby activities, notably through running training sessions for teachers. The Academy programme was launched in October 2014 and is a series of 10 rugby training sessions run in schools. 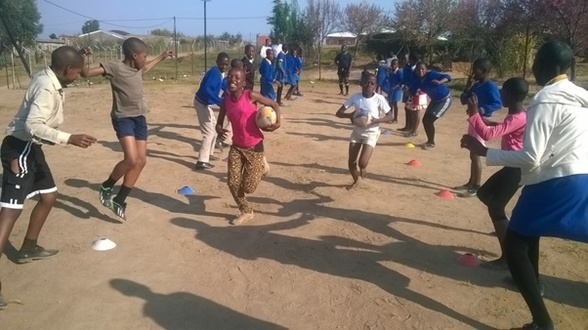 Each week, our coaches work with approximately 20 girls and 20 boys from the school to introduce the kids to rugby. In partnership with the FLR we are developing the sport at the grass-roots level and ensuring the players of the future are more experienced when representing club or country. More importantly, each session includes important lessons in key social and health issues such as HIV, healthy diets, smoking, drinking and gender equality. Through these lessons we emphasise our three key pillars - commitment, communication and respect. The message: being a rugby player means living a responsible life, responsible on and off the field.